Zoom imageFirst Hnefatalf World Championship in 2008. Hnefatafl is a board game with a history dating back over 1600 years. 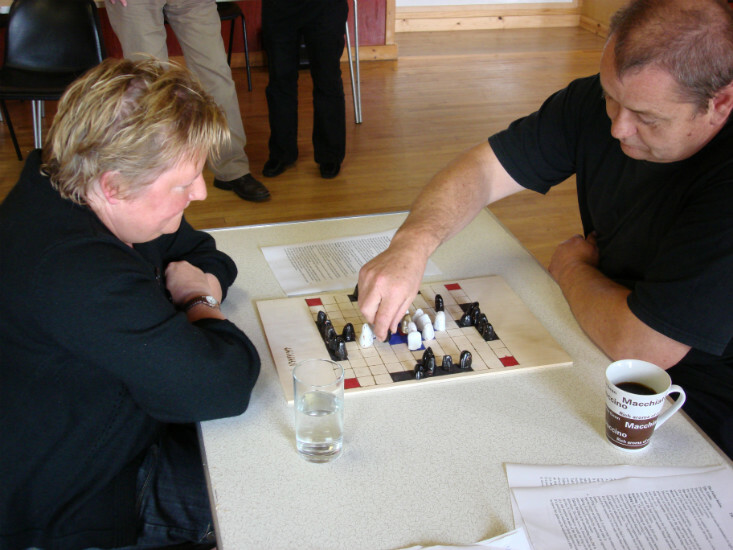 Hnefatafl enthusiasts in Fetlar established the Fetlar Hnefatafl Panel in 2007 to standardise rules and promote the game worldwide. 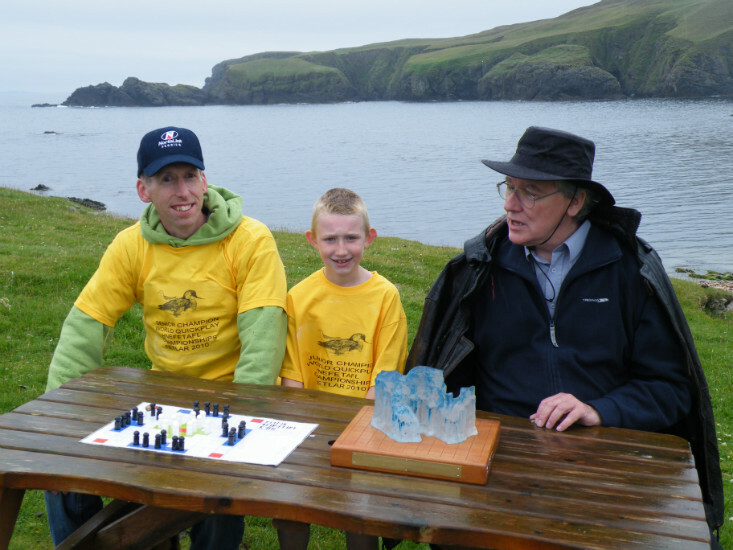 Following on from this, Fetlar has now hosted several Hnefatafl World Championships. This will be held at the Leisure Centre in Unst starting at approx. 2pm on Monday 16th July 2018. The event, this year, will be part of the award winning Unstfest festival. Taster sessions will be avalable in the morning from 10am till around 1.00pm for people to have a go at Hnefatafl with play at the championships due to start at 2.00pm. There will be both a senior and junior competition. For the Juniors you must not have reached your 16th birthday by the competition date. Registration will be open from 10am to 1.00pm on the day, or you can pre register by email to northisles@googlemail.com, up to 5pm on Sunday 15th July. Please include your name, contact details and state whether you wish to enter the Senior or Junior (<16) Tournament. If you could also include what you level of play is i.e. beginner, intermediate, expert, it woul be helpful. It is planned to play a demonstration match between the Senior and Junior Champions on a 'lifesize' board using real viking warriors as pieces. Audience aprticipation is encouraged. The game of Hnefatafl is well over 1600 years old and was played in much of North-West Europe up until the time of the first crusade. In different countries it has been known under different names and has been played on boards of different sizes. Its heyday was the period from about 400 to 1000 AD. Despite this long history a standard set of rules have not survived. The last known occurrence of it being played regularly by groups of people was when the Saami were seen to be playing it in the mid 19th. Century. They played on roll-up boards that were made on reindeer skins. The game was not as popular at that time with younger Saami players who appeared to prefer to play cards. The game appears to have been developed by the Vikings. Because there is no record, written or archaeological, of it before their times. Because pieces are taken in the same way as the Roman game Ludus Latrunculorum we assume that it is from that game that Hnefatafl was developed. Tafl is the generic name for variety of games played on a board by the Vikings and those countries influenced by them. The variations of Hnefatafl were played on boards with uneven numbers of squares. So in every case there was a central square which is the starting place for the king. There are modern games played in Egypt and Somalia (Seega) that appear to be related in some way to Hnefatafl. They use a board five squares by five and the game starts with the player gradually getting pieces on to the board before play on the board really begins. There has been some speculation about the smaller tafl boards. The Sagas report that young people were taught to swim and to play Hnefatafl. So some say that the smaller boards were used to teach children. This idea is not shared by anyone who has played on the smaller boards as the game there is harder to play even though it may not last as long. The name tawlbwrdd (throw board), used in Wales, has led to speculation that the game was played with dice. There are those who say this must be so and others who dispute the claim. It appears that chess was once played in Europe with dice to decide which piece should be moved. It was also played without dice and was then a game of skill. As chess was the game that displaced Hnefatafl it seems reasonable to assume that it was played by the Europeans, when first brought back from the Crusades in the manner that Hnefatafl had been previously. This would mean Hnefatafl could have been played with or without dice. There appears to have been some discussion in the church in the twelfth century about whether the clergy should be allowed play, or even watch chess games. This would appear to be because of the use of dice when playing. Zoom image The Fetlar Hnefatafl Panel (FHP) was set up in 2007 with the object of playing the game, testing rules and deciding a set of practical rules to publicise world-wide in order that all players were able to contend when they met with a standard set of rules. This objective was achieved and now people from Australia to Norway and the USA to England have adopted the FHP rules. The game is asymmetrical, despite the fact that the board looks exactly the same from any direction, the opposing sides not only have different numbers of pieces but different objectives. Unlike chess the pieces oppose each other from the centre and the sides. This means that Hnefatafl players need not sit opposite each other while playing. The FHP decided that the only way to test rules was by playing them out across the board. All rules and all rule changes are adopted after practical application before being publicised across the globe. The board size adopted is eleven squares by eleven squares. This is the form we know as Hnefatafl. The defender is said to have the advantage but we hope to make that advantage less over the years as the rules are developed. Zoom imageGrandmaster Peter Kelly (right) with 2010 Junior champion Dean Thomason and 2010 Senior Champion Tim Millar. Tim a glass sculptor, presented Fetlar Hnefatafl Panel with an impressive Trophy for the annual competition. The FHP decided that a popular activity would be to host a world championship tournament. There were some problems about holding such an event the first of which is the possible duration of the games. Could we finish a tournament in a day? It was possible to limit the time taken by each player by providing chess clocks and giving each player a limited amount of time to play the whole game. This is still a possibility for future competitions when there is a large number of potential players, when players want to spend more serious time on the event and when the outcome is less likely to be a number of players drawing for first place. For the present quick-play was thought to be a better plan. It ensures both sound and movement throughout the competition, keeps everyone on their toes and provides entertainment for the spectators. The time to move is given by banging a gong. Chosen over a chess buzzer because it is evocative of the sounds of men in the galleys rowing to the beat of a drum. So the Fetlar World Quickplay Hnefatafl Championship was born. The World Quickplay Hnefatafl Championship is open to all players who register in time, pay the fee and abide by the FHP rules. The organisers also try to publicise local accommodation available to competitors. There is a Junior Section and a Junior World Champion every year now. We charge an entry fee to each junior entrant but also give them all a set of pieces, a board and a set of the rules to take home with them after the tournament. An additional incentive for youngsters is the opportunity to sound the gong for a round or two for the seniors after the junior tournament has finished. If you'd like to learn more about future Hnefatafl World Championships, and perhaps even take part yourself, please sign up to our mailing list using the form in the right column of this site. We'll send you regular emails, and will keep you informed about plans for future Hnefatafl events in Fetlar. Championships - 2016 in planning, firm date and further details will be provided as soon as they are available. 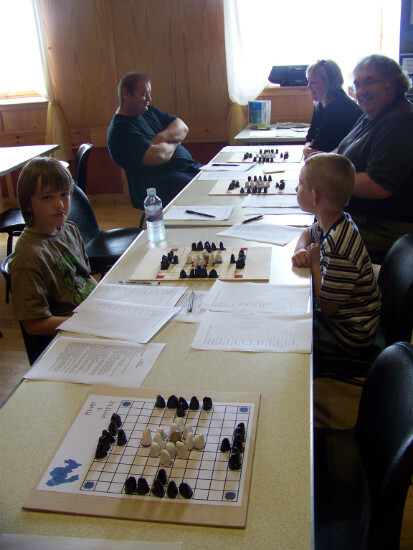 Online competitions using the Fetlar rules are run here. Please note that this link may only work with certain devices using the Firefox browser and requires "Java" to work. There is also a lot of information about Hnefatafl and its history. You can also play against the computer as well as other people. The latest 2018 version of the rules for Hnefatafl developed by the Fetlar Museum Trust ( incorporating Hnefatafl Panel ) can be downloaded here in PDF(1.5Mb) . Please note that these rules were developed for use by an 11 x 11 square board. These rules were those in force on 14-07-2018. Any updates to the rules will be posted on this page. Guidance on the speed Hnefatafl format will be available at the 2018 Championships and will be posted here prior to the start of the Championships. These are available from Fetlar Interpretive Centre, Beach of Houbie, Fetlar.